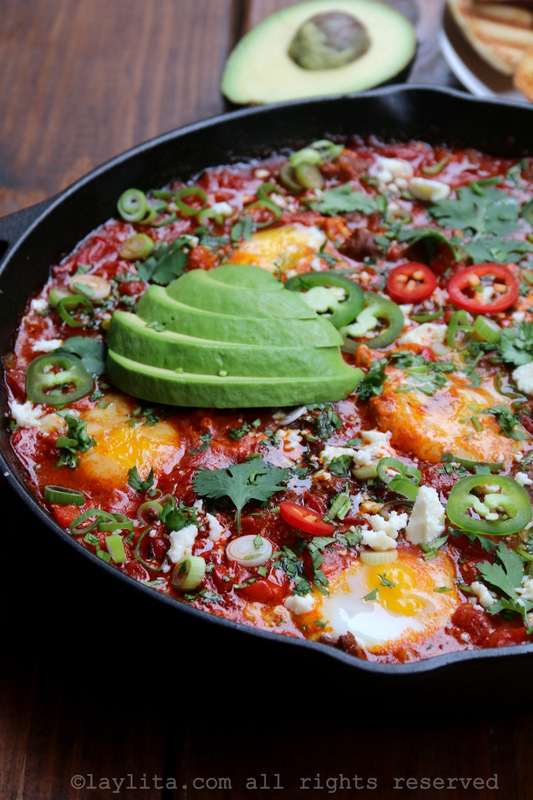 This is my Latin inspired variation of shakshuka with chorizo sausage and served queso fresco, avocado slices, green onions, and jalapeños. 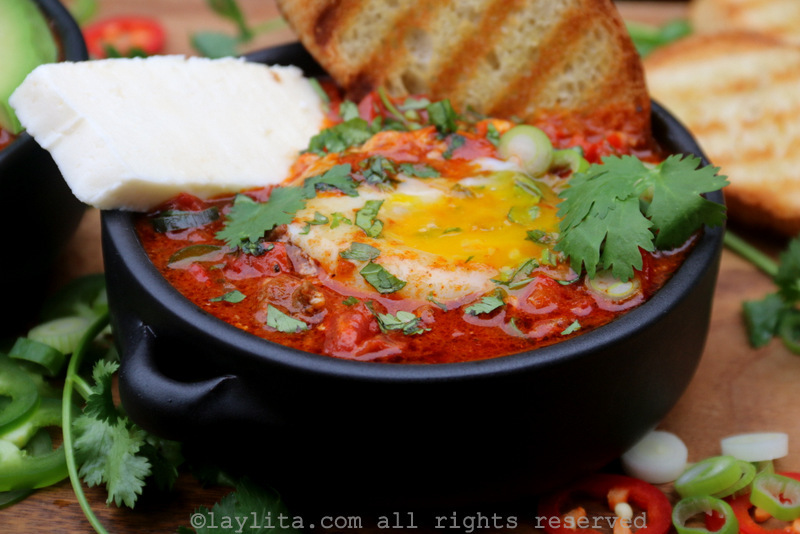 Shakshuka – also spelled as shakshouka, shukshuka, chachouka – is a North African/Middle Eastern dish of eggs cooked or poached in thick sauce of tomato, onions, peppers, and spices. 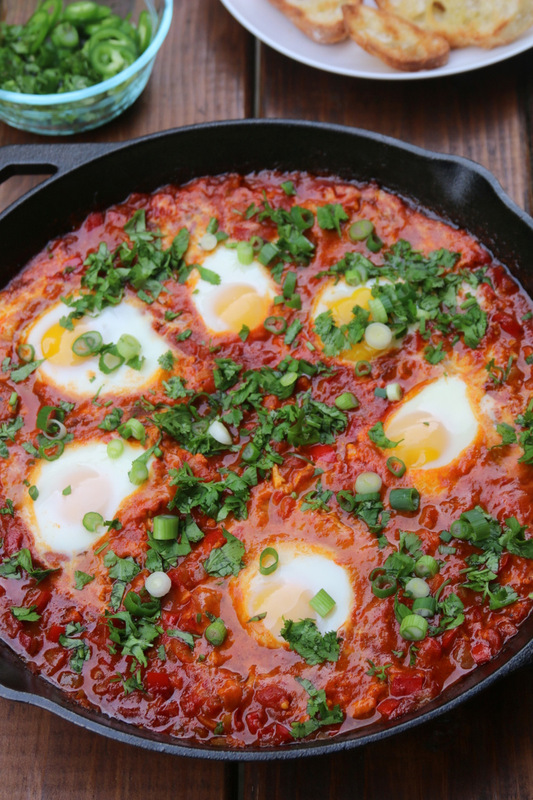 This delicious and satisfying breakfast dish originated in North Africa (Tunisia), but has become one of the most popular dishes in Israel. During my most recent visit to Israel for the Round Tables Festival with Vibe Israel I stayed at the 65 Hotel in Tel Aviv. 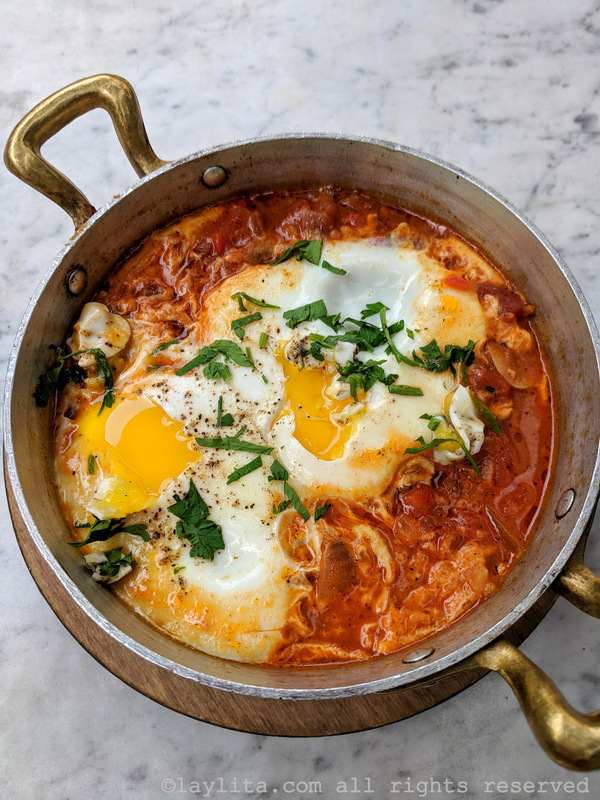 This modern boutique hotel is known for its wonderful breakfast options and I made sure to have shakshuka every day – I did alternate between the classic red tomato shakshuka and the creamy green spinach variation. 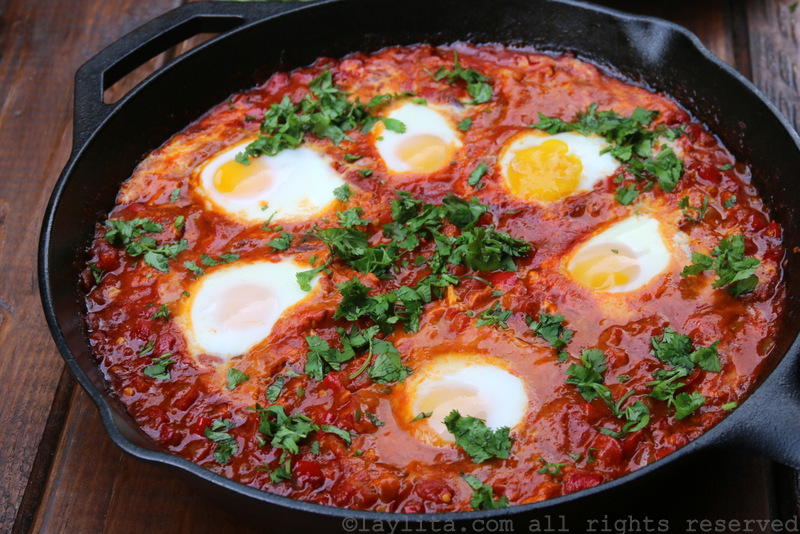 Another recommended place to try shakshuka in Israel is at the Manta Ray restaurant in Tel Aviv. 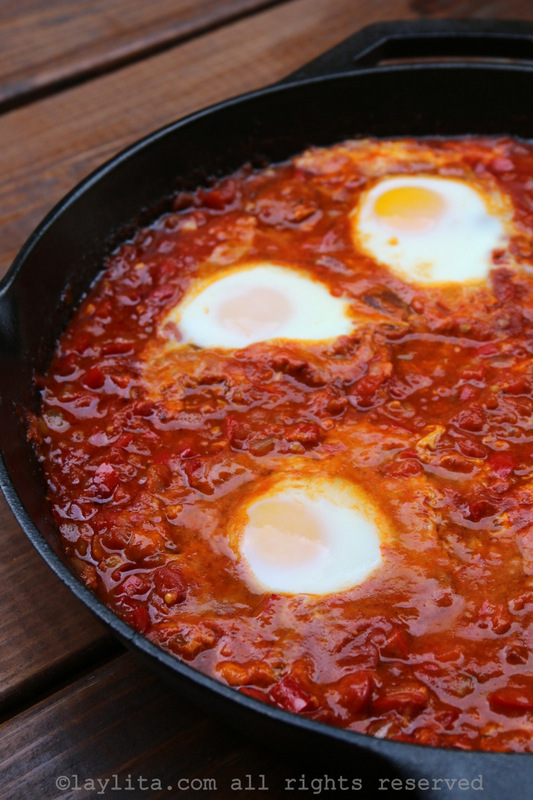 One of the most memorable shakshuka variations I’ve tried was made with merguez sausage and prepared by chef Avi Levy at the restaurant Beit Hakavan in Jerusalem. It was served as part of our first meal on the Vibe Israel Comida food tour back in 2015 and it inspired this recipe. Merguez is a Moroccan/North African spiced lamb sausage. I usually find merguez sausages in the frozen section of my local supermarket or at Ulli’s in Pike Place Market in Seattle. They’re very popular in France, my husband was the first person to introduce them to me, and so I also usually find them at the Paris-Madrid grocery store in Seattle. While it’s not very difficult to make homemade merguez sausage, I realize that it might not be readily available to everyone. You can substitute the merguez with other types of sausage and I opted for chorizo as an alternative. 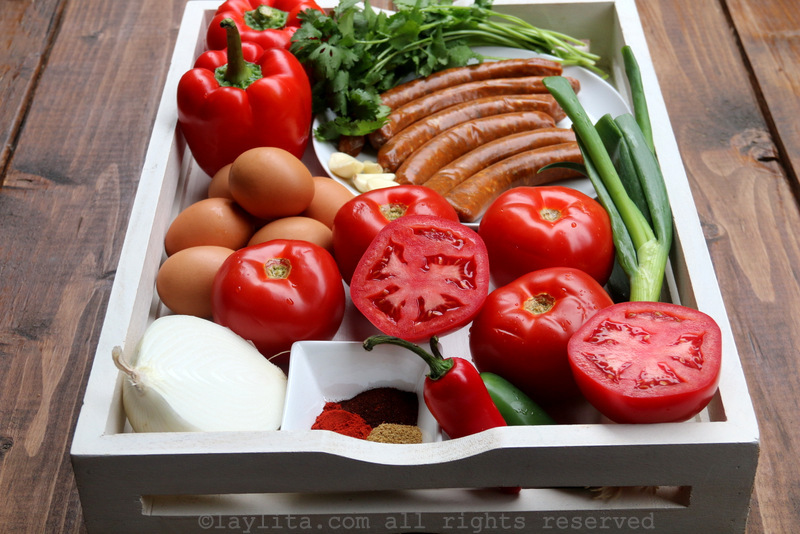 I decided to prepare this shakshuka two different ways, one with merguez and one with chorizo – fresh uncured/spicy chorizo. 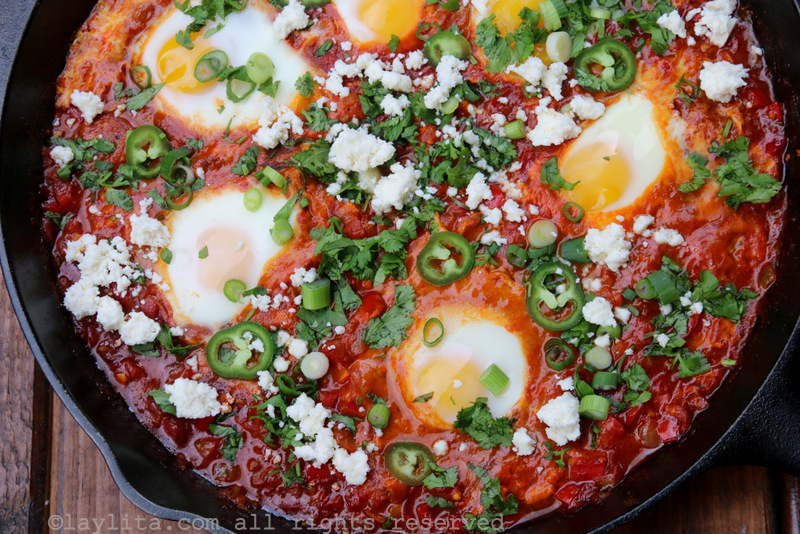 I love the combination of chorizo and eggs. 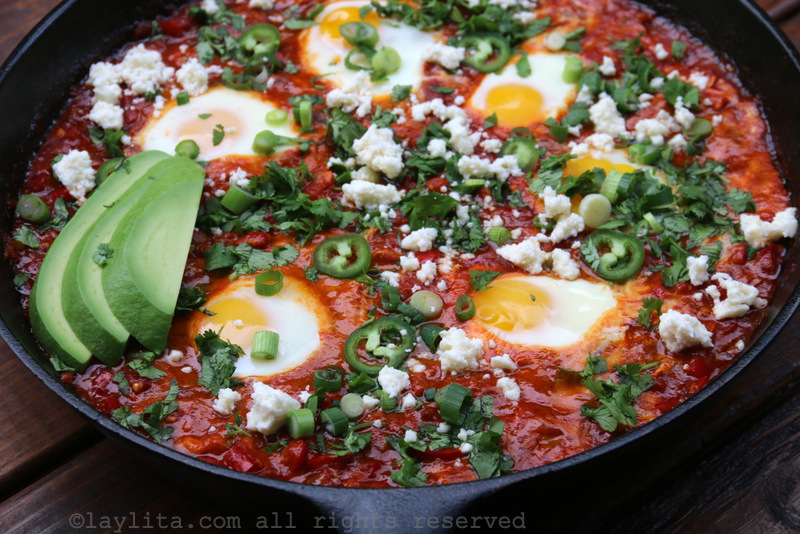 Plus I immediately knew that I would add a Latin touch to the whole dish, by adding achiote or annatto and chipotle powder to the dish itself. And also by serving with avocado slices, queso fresco, diced green onions, cilantro, and jalapeños. Both chorizo and merguez will vary in flavor and spiciness from one brand to another, so feel free to taste and adjust the spices to your taste (once the sausages are fully cooked – of course). 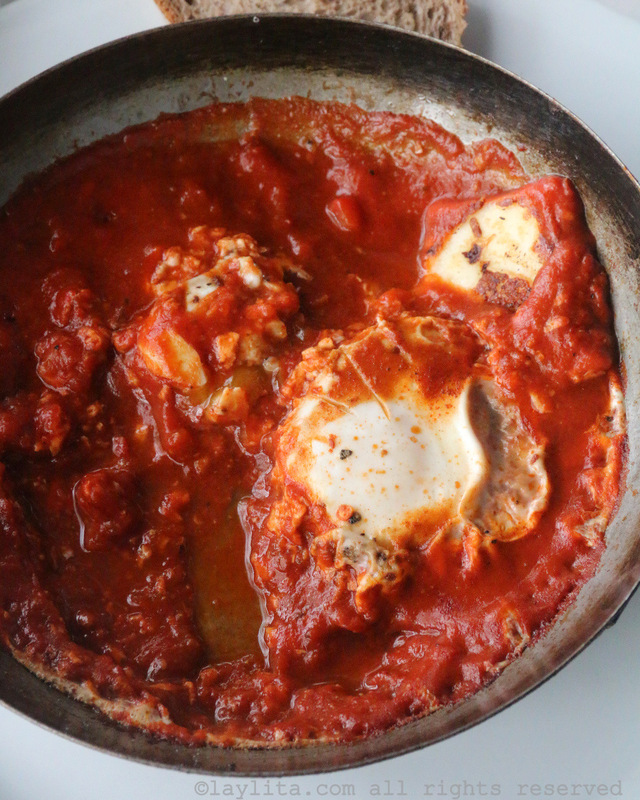 I’ve made this with and without peeling the tomatoes – and if you have time it does have a smoother consistency if you used peeled tomatoes. Another option is to use San Marzano canned tomatoes. I also tested adding the eggs and letting them poach in the pan on the stove with a lid on – versus transferring the pan (using a cast iron pan) to the oven to let them finish cooking in the oven. I preferred the oven results because they were more evenly cooked – you want the yolks to be runny. 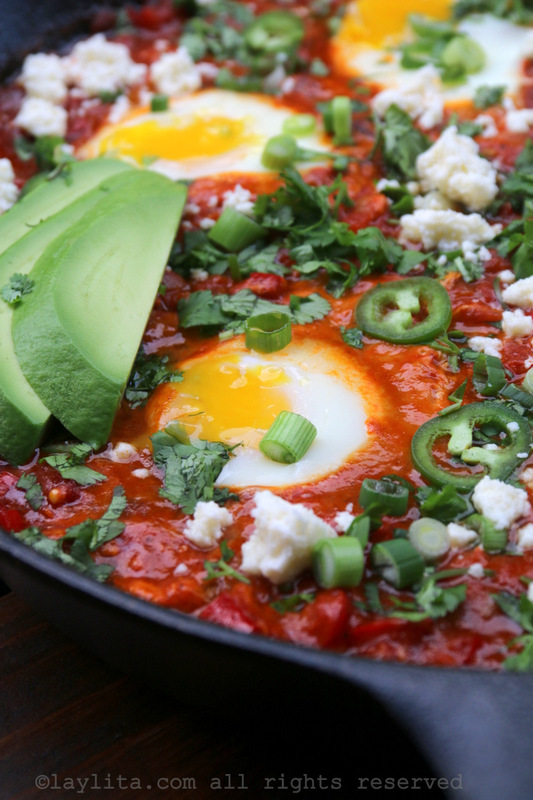 Easy recipe for shakshuka with chorizo or merguez sausage. 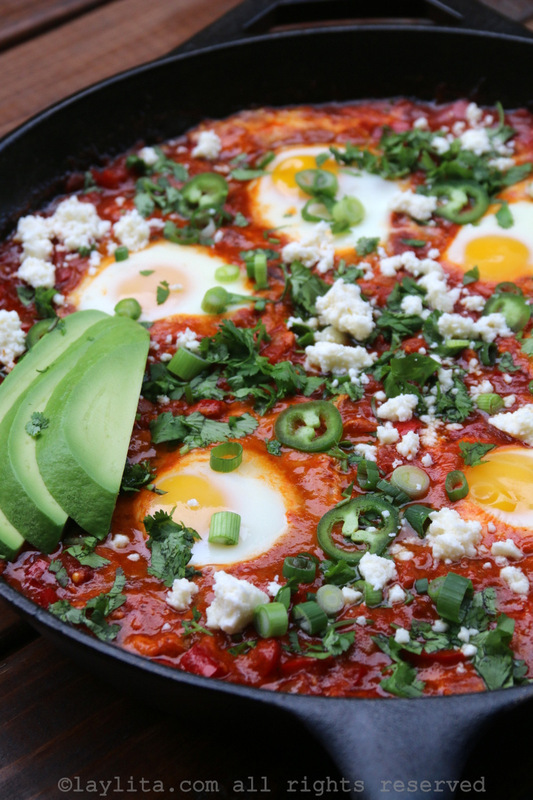 This dish consists of eggs cooked or poached in thick sauce of tomato, onions, peppers, and spices. This variation adds chorizo or merguez sausage. 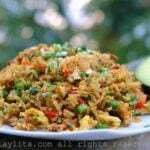 Heat the oil and add the diced onions, crushed garlic, and diced bell peppers. Cook until the onions and peppers are soft, about 5 to 7 minutes. Add the spices: achiote/annatto (or paprika), cumin powder, chipotle powder (or your choice of chili powder), diced hot pepper, salt/pepper. Add the sliced chorizo or crumbled merguez, continue to cook for another 10 minutes. Add the diced tomatoes and continue cooking for another 20-25 minutes, or until the tomatoes have broken down and you start to have a nice thick sauce. Taste and adjust salt/pepper/spices to your taste. Add the eggs, cover, and cook until the whites are fully cooked and the yolks are done to your preference, about 10-12 minutes. 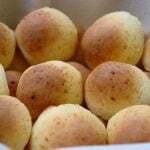 For the oven method, have the oven pre-heated to 375F, carefully transfer the hot pan (oven proof) to the oven’s middle rack, and bake for about 10 minutes. Remove the pan from the heat, sprinkle with freshly chopped cilantro, green onions, jalapeno slices (optional), and crumbled queso fresco. Serve immediately with avocado slices, garlic bread or toasted pita bread, etc. Thank you Layla! I can’t wait to try this.